Patterned and textured nail polishes have been a recent trend and you can finally DIY with Sally Hansen's Salon Effects Real Nail Color Strips. They are basically nail strips that you can use that stick to your nails without the mess of the polish application. They are "pre-made" with the patterns on it or if you choose just a plain color, it's literally a SMOOTH, instantaneous nail polish change! 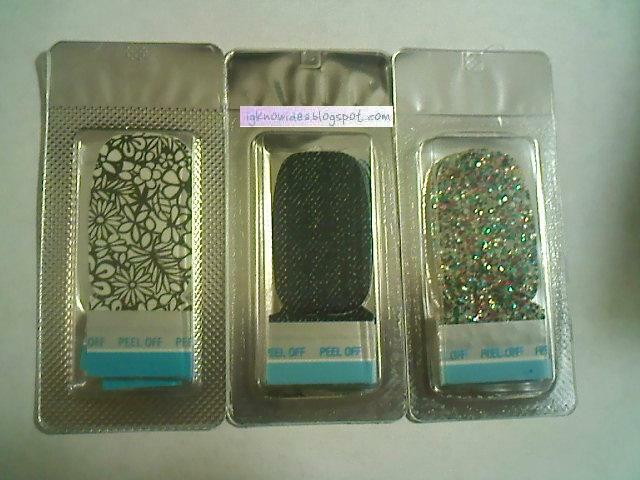 Each box comes with 16 strips, a cuticle stick, and a mini filer. Since my nails are a bit small, I can get away with using one of the strips TWICE. ;) The color choices are pretty diverse considering this is a new collection. Neons are bright and definitely noticeable and comes in 8 different shades. There are 5 various Metallics you can choose from and 10 High-Fashion Patterns. I personally like the patterns best b/c they are unique and unless you make your own from polishes, how else are you going to get them, right? 1) Cut It Out - This white & black floral pattern is pretty for the Spring. It's flowery and very retro looking! It's best to wear this w/ a solid toned outfit. 2) Skinny Jeans - Think Denim! It's dark blue and looks great. This and all the other colors have a thin plastic sheen over it, so it doesn't have the denim-feel. Ease of use? This definitely takes a bit of learning to use these nail color strips. You have to be careful when applying so it goes on smooth but once you get the hang of it, it's fun! The results are amazing and this really lasts more than a week!